UPDATE: This particular item is gone, but you can still use your $10 credit on any one of the 1000s of items on the site! If you haven't joined Copious yet, now is a great time to do so! New members get a $10 credit and I just found this 8 piece Burt's Bees set for $10 with free shipping! 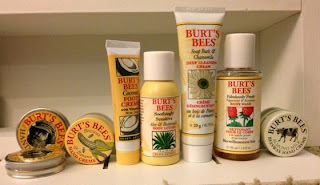 ($5 will show up immediately, it might take a few minutes for the other $10 to show in your account) You can easily find this set by entering "8 Burt's Bees Products" into the search bar at the top of the site. You'll just have to pay 1 cent to verify your purchase! When you purchase, make sure you enter in the amount of credit you want to use ($9.99) and hit "Apply Credit". The only catch is that there is only one of these sets, and when it's gone it's gone. So if you're not the lucky one to get it, you can still use your credit to find other great freebies! (well, 1 cent freebies lol) I've found there are tons of items under $10 in the "Health & Beauty" category, but feel free to browse around...there are 1000s of products to check out! Click here to get your credit!